I’m always quite surprised at how relatively little coverage media companies get on investing sites like Seeking Alpha. The Walt Disney Company (NYSE:DIS) is obviously the exception to the rule but take a look at companies like Time Warner Inc., Viacom and Discovery Communications and they don’t get nearly as much coverage as you might imagine; surprising given that as a group the pure play media companies are exceptionally profitable enterprises. A big chunk of what current coverage there is will revolve around disruption. The thing with the media stocks is that they currently straddle the boundary of technological changes as more and more people opt to consume content over the internet rather than through television. Disney stock is somewhere in the middle of that. On the one hand you get his brand equity effect that works by sucking generations of kids into their original content library, right from the timeless classic characters like Mickey Mouse to recent acquisitions like the Star Wars and Marvel superhero franchises. On the other hand is the media network business model of ads and subscriptions that sums up networks like ESPN. What Disney has gotten absurdly good at over the years (especially the more recent ones) is integrating all the juicy bits of the first part as well as milking the hunger for pro sports with the ESPN juggernaut. When you lump it all together you just see one enormously profitable enterprise: one that is generating 20% returns on capital, 25% operating margins and a market value that has compounded at an annual double digit rate for the past fifty years after backing out inflation. They probably don’t require much in the way of explanation. The first represents the flagship resorts like Disney World; the second is the movie making side of things; the third is physical merchandise like toys and the latter contains the networks like ESPN. As I said above what Disney have perfected over the years is taking the first three segments and linking them up tight. When you hear finance types talk about unlocking value this is what they have in mind. The company is now one of the best at squeezing as many dollars as possible from their content: release a hit film; build a huge amount of branding around the characters; sell toys and games off those licenses; stuff lifestyle versions of them in their resorts to get kids begging their parents to go, and so on. It has become a part of everyday life through the years – to the point where we really take it for granted – but behind it is a truly phenomenal business. In 2015 for example those three segments earned $6.7bn in combined operating income on revenue of $28bn. They’ve added the Star Wars franchise for what looks like astonishingly good value – costing them just $4bn back in 2012 – as well as buying Marvel in 2009 for a similar amount. Both will go down as two of the best deals of the century. These are the bread and butter segments. Disney is to children what Unilever is to households. There is a clear corporate strategy and identity in the rich content library that they have built up. The growth over the past few years speaks for itself with operating income compounding at a rate of about 20% per year since 2010. Star Wars for example has been popular for fifty years, and my four year nephew is already hooked on the original trilogy. In fifty years time I imagine his kids will have been to Disney World more times then me and him combined. Each year the company will harvest the dollars of millions of parents, children and cinema goers who will pack out cinemas and Disney stores to watch a new Star Wars film or buy the latest toy for a child’s birthday. It would take a huge effort, if its even possible, for any competitors to disrupt and degrade the content that has been cultivated over the years. The other half of the Disney conglomerate is Media Networks, and the segment is pretty well dominated by the earnings of ESPN. Disney owns 80% and Hearst owns the rest. The remainder of the segment’s profits comes from other networks like ABC. 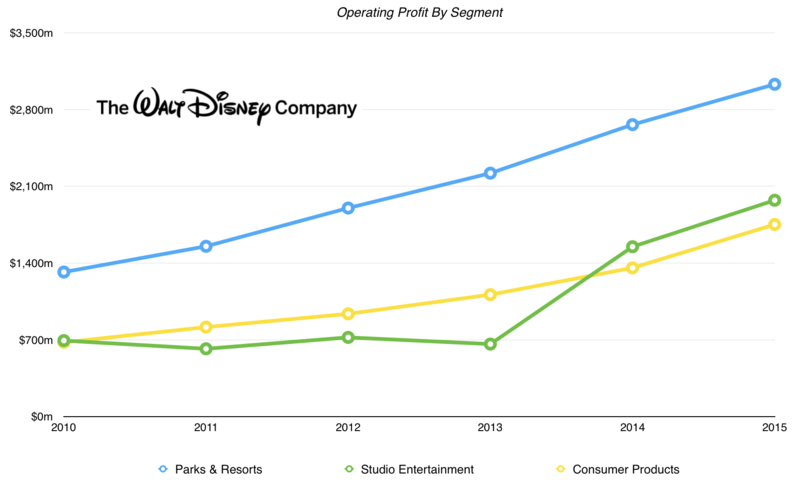 To put it into some context you’re talking about just under 50% of entire Disney profits coming from ESPN alone. The kicker is that this segment looks to be the one most susceptible to the kind of disruption talked about in the opening few paragraphs. As a rule of thumb most catastrophic projections made by stock pundits and talking heads either don’t happen or they take a very long time to come about, and ESPN being slain by cord cutting is probably one of those doom type scenarios that entire articles on Seeking Alpha are dedicated too. ESPN subscriber numbers being down is what helped set off the mini panic in media stocks last year. The difference between ESPN and the rest of the business is down to content origination. When I wrote a similar piece on Seeking Alpha – Disney: More Than Just The King Of Content – I made a quick point at the end pondering on whether ESPN should be spun off on its own. That way you get a core company that is extremely focused on the original and acquired content that basically defines Disney in the eyes of millions of people today, plus management have been terrific at juicing that area of the business for profit down the years. The ESPN spin off would then be left in the hands of shareholders to decide what do with. Ultimately if you’re the kind of shareholder happy to own Disney stock for the long haul – reinvesting those dividends every year and periodically adding when the value looks good – then looking back thirty or forty years from now it probably won’t matter much anyway. It’s one of those businesses in which an investment given the advantages of long stretches of time will make you significantly more wealthy than when you started.